Thankful for Snow? It’s In the Forecast!!! By John_Hamilton on November 3, 2011, 7:24 pm Comments Off on Thankful for Snow? It’s In the Forecast!!! 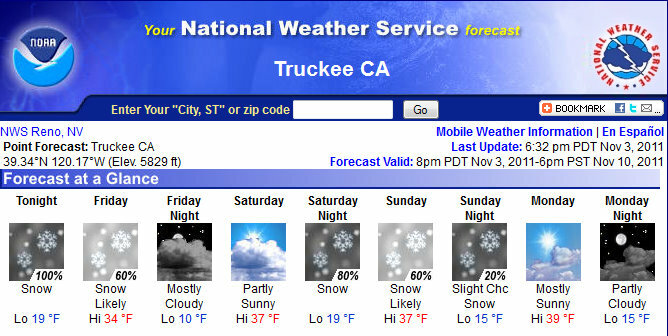 Trucke, CA…Tonight: Snow. Low around 19. West wind around 10 mph. Chance of precipitation is 100%. Total nighttime snow accumulation of 3 to 5 inches possible. Friday: Snow showers likely, mainly before 11am. Mostly cloudy, with a high near 34. North wind around 5 mph. Chance of precipitation is 60%. New snow accumulation of around an inch possible. Friday Night: Mostly cloudy, with a low around 10. Northwest wind around 5 mph becoming calm. Saturday: Partly sunny, with a high near 37. Southwest wind between 5 and 10 mph. Saturday Night: Snow. Low around 19. Southwest wind between 10 and 15 mph. Chance of precipitation is 80%. New snow accumulation of 2 to 4 inches possible. Sunday: Snow likely. Mostly cloudy, with a high near 37. Chance of precipitation is 60%. New snow accumulation of less than one inch possible. Sunday Night: A 20 percent chance of snow. Mostly cloudy, with a low around 15. Tuesday Night: A slight chance of rain and snow showers. Partly cloudy, with a low around 16. Wednesday: A slight chance of showers. Partly sunny, with a high near 46. Wednesday Night: A slight chance of showers. Mostly cloudy, with a low around 16. Thursday: Partly sunny, with a high near 48. MODERATE SNOW SHOWERS WILL CONTINUE OVERNIGHT. PASSES. THIS INCLUDES DONNER SUMMIT ALONG INTERSTATE 80. NORTHEAST CALIFORNIA AND WESTERN NEVADA. ADVISORY /RNOWSWREV KREV WWUS45/ FOR ADDITIONAL INFORMATION. FORECASTS IF TRAVEL IS PLANNED SATURDAY NIGHT OR SUNDAY MORNING. ACCORDANCE TO STANDARD OPERATING PROCEDURES.